Today I bring you another Keto post. I hope you have been enjoying this type of content? I have been enjoying testing and reviewing these products. If you want to see me review something that I haven’t yet or you have ideas on content please feel free in reaching out you can find all of my links in the “Where You Can Follow Me” section or if you aren’t into social media you can always comment on any post. All of my keto products have been purchased with my own money. If you are curious about the ketogenic “diet” or you want to learn more you can click here. Keto Reboot Excel Kit – What is it? 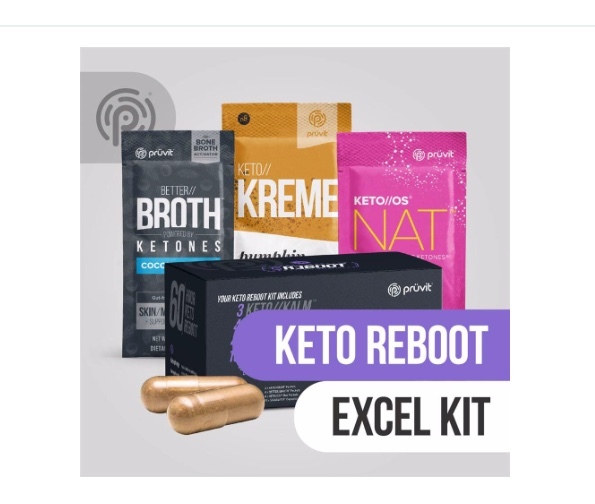 Pruvit’s Keto Reboot Excel kit was first released and available for a limited time in early December. The Keto Reboot Excel contains the standard Keto Reboot 60 Hour Fast plus all the supplements you need to PREBOOT, and OPTIMIZE your progress for 30 days. The main reason to do the Keto Reboot is to reset your metabolism by reprogramming your genes to run on fat for fuel! By conquering a 60 hour fast, you engage your body to use fat as an energy source while gradually shifting into Keto Adaptation. THIS is what we’re all looking for right? To burn that fat off our love handles and middle sections! Well, you have to sacrifice something to get those stubborn areas burning – and forgoing food for 60 hours utilizing the Keto Reboot kit has become a very popular way to get things moving! Why do the Keto Reboot 60 Hour Fast? If you answer YES to any of these questions, the Keto Reboot 60 Hour Fast is a great program to try! Do you need a jump start with FAT LOSS? Do you experience hunger and cravings? Could you use some help with your next fast or cleanse? Preboot Before the Keto Reboot! We love to coin phrases, and “getting your PREBOOT on” is not just a Pruver-ism, but a very wise decision! Why? Quite simply: KETO ADAPTATION – getting your body used to exogenous ketones and being in a state of ketosis. By getting started on Pruvit’s products before you jump headfirst into the 60 hour Keto Reboot, you’ll give your body a chance to slowly Keto adapt and complete some shorter intermittent fasting days leading up to the 60 hour fast. This is why the Keto Reboot Excel kit was created – to help those just getting started to get ready for the reboot, to conquer the reboot, and to continue to optimize your hard-earned results! If you’re used to eating a high carb/high sugar diet, you may have more unwanted detox side effects (headaches, etc) than you anticipated if you don’t “prime the pump” before completing the reboot. This is an investment in your health, not a quick fix – there is no such thing when it comes to health. Without priming and optimizing – the only other place to go is back to bad habits. This is true for any long term health strategy. What’s in the Keto Reboot Excel Package? The Keto Reboot Excel program is a great way to complete the Keto Reboot 60 hour fast PLUS continue to optimize your results post reboot for an entire month, and it comes with coaching. Having the proper guidance and nutritional supplements for fasting and cleansing your body makes it easier and more effective, plain and simple. When I say “optimize” I don’t mean continue fasting with no food for 30 days! Let me explain…once you’ve prebooted and completed the 60 hour fast, you break your fast and begin to eat again. However, the goal is to stay in a fat burning state of ketosis, and the supplements provided in the Keto Reboot Excel kit make it easy and enjoyable to do so. Having a selection of Keto Kreme to make fat coffee, Keto Max for energy and fuel source to crush appetite, and Better Broth as a meal or snack will keep those ketone levels high and KEEP YOU IN KETOSIS. Are You Ready for YOUR 60 Hour Fast? When are Keto Reboots on Sale? Pruvit hosts the Keto Reboot 60 hour fast each and every month, and kits are usually on sale the first week of each month, however both the Keto Reboot and Keto Reboot Excel are available now for a limited time (early). Next group Reboot start date is Feb 1st 2019! You can choose to purchase just the Keto Reboot 60 Hour Fast (standard kit), or you can choose the Keto Reboot Excel program. If you’re new to ketones and ketosis, I highly recommend the Keto Reboot Excel kit, your post reboot body will thank you! Ease into Keto adaption with Pruvit’s most popular products, conquer your Keto Reboot 60 hour fast, and have some product on hand to keep going for an entire month. YOU’RE GOING TO SEE RESULTS!! In the way you feel, the way you look, your attitude towards food – simply #BETTER. NEXT REBOOT Is February 10th!!! I’ve been drinking ketones daily for 1 1/2 years and honestly can’t imagine life without them! I’m very passionate about this conversation and enjoy sharing it with others. For me, drinking ketones daily gives me energy throughout the day without crashing, keeps me fueled and motivated to workout, lifts my mood, and keep my cravings under control ( I use to drink so much diet soda and since drinking ketones and keto kreme even my snacking has been under control). This is where the Keto Reboot 60 hour fast is very helpful for me. It gives me that reset that I need to get back to burning that fat for fuel and eliminate belly bloat! There’s no better time to get started towards a healthy goal.